China and India may have similar populations today, but they have very different demographic destinies. While China should see its population fall in the coming decades, India projects to be the most populous country in 2050 by a long shot. By that time, India will have up to 1.7 billion people – and Mumbai will be the largest megacity in the world with upwards of 42 million people. These kind of future trends are not evident from the base population figures alone, but they become much clearer when we look at the population pyramids of countries instead. How many people are being born? How long are people living? Analyzing these factors can give us an idea of the direction a country is trending, and whether it will continue to grow in terms of population. Below are three typical patterns for population growth: rapid, slow, and negative. How do the population charts for the top 10 countries compare, using these kinds of classifications? 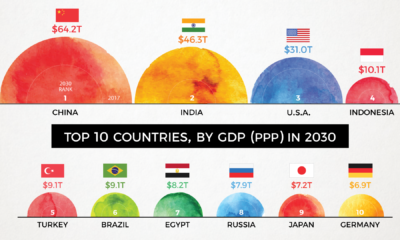 According to the above graphs, India, Indonesia, Nigeria, Mexico, Brazil, Bangladesh, and Pakistan will continue to grow their populations at a rapid pace. Nigeria is growing at a particularly fast rate, and by 2060 it will displace the U.S. as the third-largest country in the world by population. The United States stands out here as the only country in the top 10 experiencing tempered growth. That said, the U.N. sees the country hitting 400 million people around the year 2060 if trends continue. China, because of its One-Child Policy from 1979 to 2015, is not a surprise to see here. However, Russia may be an intriguing mention in this category for many – the country has a low birth rate, a low immigration rate, and an unusually high death rate. In fact, Russia’s death rate is 15 people per 1,000 – almost twice that of the U.S. due to a high amount of alcohol-related deaths and emergencies. The above classifications are mostly intuitive. With the exception of China (and its self-inflicted wound from the One-Child Policy), the countries experiencing slower or negative growth are the ones with more mature economies.